They say that hindsight is 20/20. For the past decade, I have been a huge fan of body weight calisthenics. I loved the way it made me feel after a workout. I loved how I had a whole body oneness. The thing I didn’t love however is the fact that I could not build muscle for the life of me. The answer I found was… yes… and no. The reason that weight lifters gain mass is because they are following the principles that cause muscle growth. The reason that calisthenics typically do not help people build size is because they follow the principles of muscular endurance NOT growth. There is a huge difference. Its not inherently the “weight” that puts weight lifters at an advantage but their method of training. 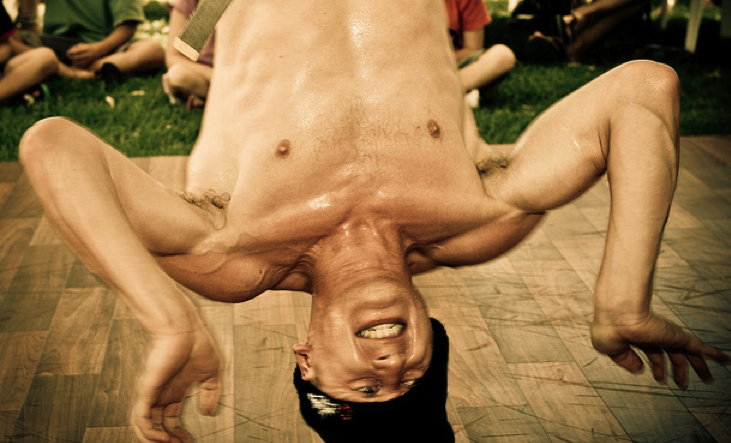 Bodyweight Overload is simply a method of training borrowed from traditional body building and applied to calisthenics. On Monday, I will be leading about 25 participants through a 6 week trial period to test my theories of muscular growth using calisthenics. These participants are ready for battle and ready to make the transformation of a life time. Over the course of the next 6 weeks I will be keeping you updated on their progress. Unless you applied via the form I sent out last Friday there are no current openings in the test group. However, in 6 weeks I will be showing you their before and after shots. I anticipate some great transformations. You can start your own journey to transformation right now. The word “calisthenics”, for many people, conjures up an image of an army troop in a field doing countless jumping jacks, push ups and flutter kicks. I remember when I lived outside of campus at Western Michigan University, I would hear ROTC in training at 5am. They spent much of their time in physical training performing endless push ups, squats, running sequences, etc. What do bodybuilders do differently? 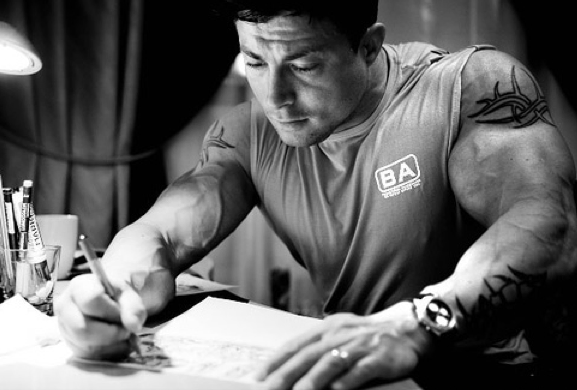 Bodybuilders focus on low repetitions. Their goal is to build size so they overload the muscle faster, causing micro tears and allowing for the muscle to grow. 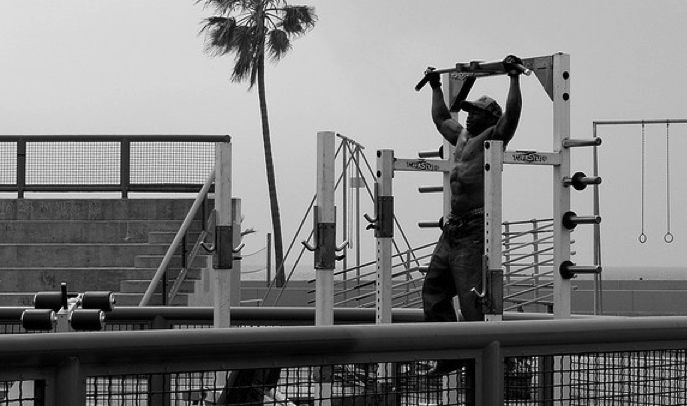 If you want to build size using calisthenics you have to do the same thing. You can’t get into a rhythmic sequence of movement and crank out hundreds of jumping jacks or squats in the rep ranges of 30-40. You have to drop that number down. You have to perform rep ranges within about 8-12 for muscular hypertrophy. Is it really that easy? All I have to do is stop at 12 reps and my muscles will grow? Angular Training is simply a method of adjusting the angle of your body to make an exercise more difficult. 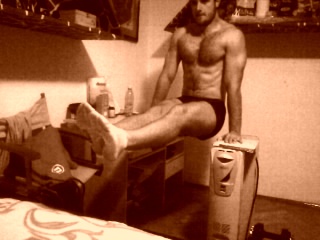 For example, if you want to make a push up more difficult you can put your feet on a chair. This position angles your body downward and puts an emphasis on your upper pecs. There are many different ways of angling your body to make an exercise more difficult. Play around with your body angle while doing calisthenics to make an exercise more challenging. The below pictures are from Ivan, one of our SOA community members and “Bodyweight Overload” participants. Both of the below moves show how to work the chest muscle group. The first one is an L-Seat and the other is a dip. Both work the lower part of the chest muscle but by placing his legs in a different spot he changes the angle. Ivan also shows us how creative you can be if you don’t have equipment at home. Here he uses part of his computer and a shelf. I’m hopin’ that’s a “Macintosh” Ivan! Otherwise, you’re screwed. Thanks Ivan for the great shots!!! Looking strong bud! This is the creme of the crop… the prized gem… the big Bertha of techniques to make a body weight calisthenic more difficult. 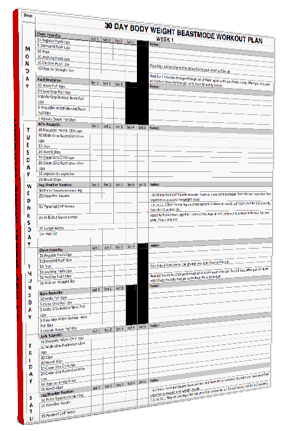 I will go into this in much more detail in my up and coming “Bodyweight Overload 6 Week Program”. For now, realize that weight distribution is an extremely effective way of fatiguing the muscle fast. Let’s use the push up example again. Say you have reached a particular point in your push up ability and can crank out 40-50 in a row. That’s great. The problem is that if you keep doing that many reps then you will not be gaining size. You’ll only be working toward muscular endurance. Instead of keeping your weight distribution 50/50 on both arms shift your weight to one side so that its about 70/30 or 80/20. Then try your push ups. You’ll instantly and dramatically alter the difficulty of the exercise. Keep adjusting your weight while you do your push ups so that you fatigue in the 8-12 rep range. Then switch sides. Another key difference between traditional body building and calisthenics is the fact that body builders perform more sets of the same exercise. Their goal again is to fatigue the muscle and tear tissue. In order to do this you need to perform multiple sets of the same exercise. Most body building routines include at least 4 sets, often more. In my “Bodyweight Overload” program I have participants do eight sets for many exercises. The reason that multiple sets are so important for building muscle is because it takes TIME to fully fatigue the muscle. You need to consistently bring the same muscle to fatigue in order to tear muscle tissue. What is a split workout plan? A split plan is where you do one body part per day. For example, you do a chest workout on Monday, Back workout on Tuesday, Legs on Wednesday, etc. You can follow the above split or create your own but if you want to build size, than you will definitely will want to do some type of split. I love body weight exercises as much as anyone. And one of the benefits that I have touted for years is the fact that you can get a full body workout in half the time. That’s great for developing whole body strength. So if you are a bar fanatic, than you need this whole body strength. However, if you want to build muscle than you need to do more isolation and target the muscle specifically. When you do your workouts spend more time on each muscle group. 30-45 minutes is not too long to spend on a single part of the body. For example, say you are doing a chest workout. You can tack on extra X Push Ups at the end of your workout. Instead of doing 3 sets of push ups you could do 4, 5 or even 6 sets. Your muscles will not be used to it so they will fatigue faster. Be careful with this one because you CAN over train. Adjusting the number of workouts each week can be a very effective method of progressively overloading the muscle. If you are used to 4 workouts per week add a 5th or 6th workout to your week. P.S. I want to give you a HUGE 65% Off Discount on my complete Muscle Building Program Using JUST Bodyweight Exercises.